PC gamers and Steam users are usually one in the same, given how convenient Steam can be and the sales that take place in Valve's digital distribution platform. Even gamers outside of the PC realm know of Steam and the different types of sales that take place, be they holiday sales, daily sales, and the infamous summer sale. 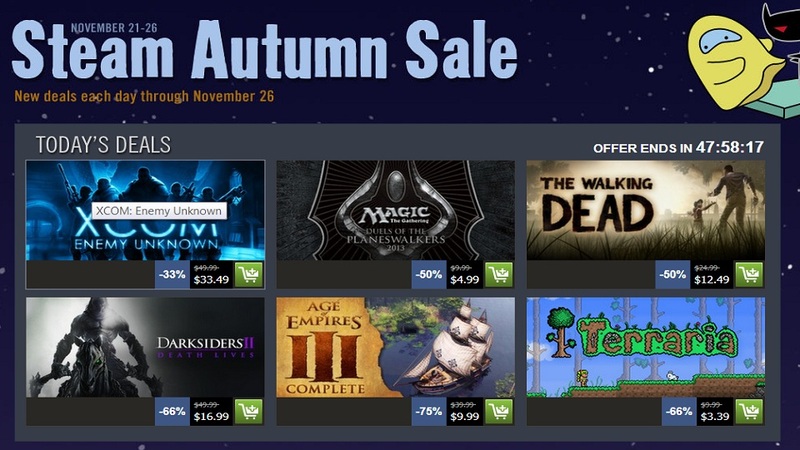 In a recent post on Reddit from the Steamworks developer group, it was announced that the Autumn Steam sale would be held from November 25 until December 1, with the Winter Steam sale taking place from December 22 to January 4. The announcement of the seasonal Steam sale dates also came with a notice that flash and daily sales will not be occurring during the Autumn or Winter Steam sales. Instead, all of the games that will go on sale will be available for their lowered price throughout the entire sale period. This means that Steam users will not have to check in daily to check out all of the new deals and additionally, gamers will no longer miss out on any sales because they weren't able to check Steam during a period in which a game they wanted was on sale. While gamers using Steam won't see flash or daily sales for the rest of the year, this could be a greater opportunity for gamers who are just looking to get games during sales. Will this hinder revenue for Valve or cause it to grow? When the Autumn and Winter sales come around, will you miss flash sales or do you think that you'll prefer this form of sale? Pyroman and God like this.